A traveling brass wire is energized with a high frequency DC Current to produce a 10,000 degree centigrade spark at rates up to 500,000 cycles per second. 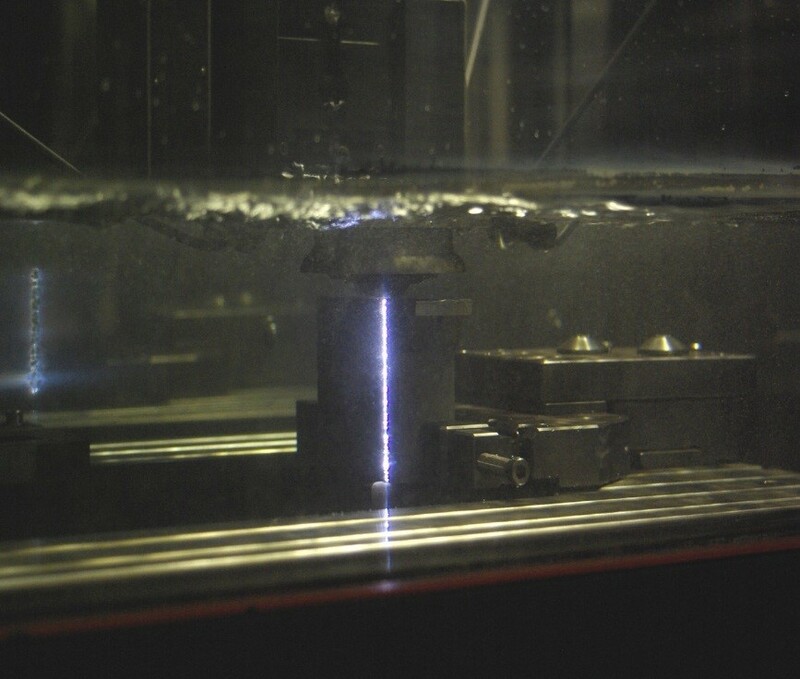 As long as the work piece is electrically conductive, the hardest of materials are vaporized. Heat treating tool steel, before making parts out of it, eliminates the slight distortion that typically occurs after making parts. 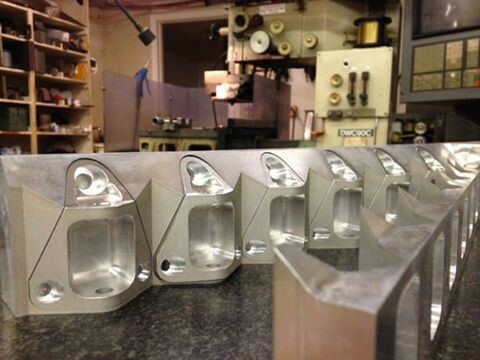 The EDM process allows cutting parts from materials that are already hardened. This is one of many advantages offered by the electrical discharge machining process. 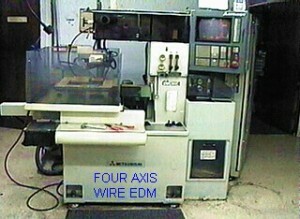 Unlike the sinker, (or ram), EDM which is typically used to burn shapes in to work pieces from one side at a time, (blind), the wire EDM process must go through the work piece. The wire is then controlled by the upper, and lower diamond guides, being driven by the CNC section of the machine. On parallel cuts these axes move in unison, but another advantage of the process is that they also function independently. This allows the wire to “lean over” at angles up to 30 degrees, tracing two different geometries through the part (upper, and lower). Its similar to flossing your teeth, except the wire is always a straight line. The wire EDM process in “rough cutting” leaves a finish, and accuracy that is far superior to plasma, water jet, or flame cutting, but we don’t stop there. The rough cut, in order to apply more power to the wire, is relatively slack. This shows up in profile corners, and although invisible to the eye, we know its there, and the process for precision wire cutting, is similar to the sinker electrodes orbit. That is to take multiple “skim” cuts with a tighter wire, at progressively lower power settings. This produces finish and accuracy that is unsurpassed by any other methods. Typical profile tolerance at this point in on the order of +/- .0001”. Internal profiles are accomplished by ram burning, (or drilling) start holes through which the wire is threaded, and then processed normally. If there is a “down side” to wire EDM it is that it is quite slow, and one other detail that occurs now and then, is trying to accomplish a sharp inside corner. No matter how small a wire you use you have to leave a small (.005”) radius on a inside corner. Sometimes we are not allowed to “relieve” that corner with the wire, to allow the fitting of a theoretically sharp part. Never the less when you want to build a complex punch, and die profile, and control the clearance between them at +/-.0001 the wire EDM, quite often, is capable of doing work that is impossible by any other means. 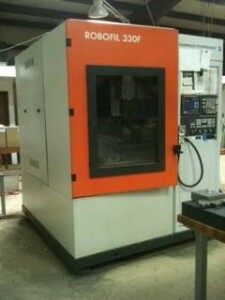 The cost of EDM does not lend itself well to production work, but is highly justified when a EDM’d dieset, or EDM’d mold cavity starts producing thousands of accurate, and complex parts. 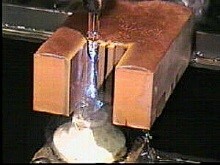 The wire EDM process creates debris. Flushing is necessary to continue cutting efficiently, therefore both systems produce flushing pressures upwards of 300 psi. To remove this vaporized material. In a non-submersible machine, flushing is limited to getting flushing into the wire kerf. When cutting a part that is not solid, red sparks can be seen where the wire is exposed, and without coolant. This indicates unstable cutting and a probable wire break. For this reason non-submersible machines don’t lend themselves well to interrupted cutting. 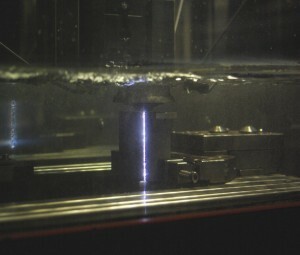 The top photo above exhibits a bright blue/white submerged spark. This would continue even if the part were not solid (interrupted cut). Although the spark is quite hot, the wire, and the work piece are cool, and unlike the non-submersible method, the wire is not exposed to atmosphere.